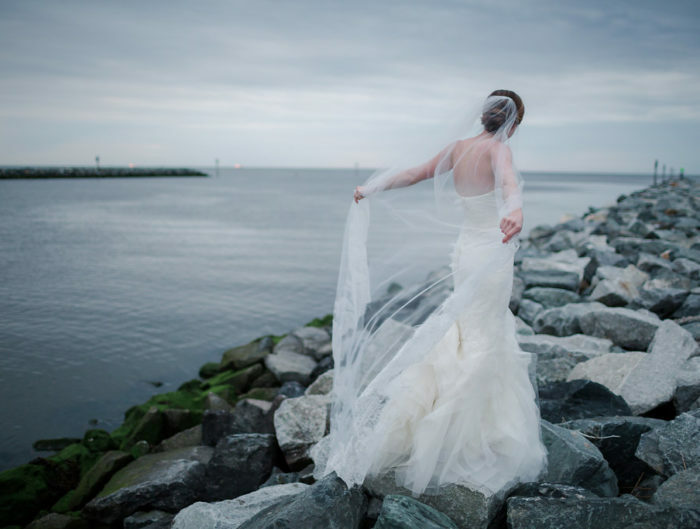 Aly and Matt’s Washington DC wedding took place at a modern art gallery in the city. Their coral and pink wedding decor was a lovely, classic contrast to the stark and urban event space at the gallery. (Even though you don’t usually see her, you might recognize this beautiful bride as Aly from DC’s country radio WMZQ!) They said “I do!” at Longview Gallery, surrounded by loved ones and lots of romantic prettiness! The palette was perfectly mixed up, right down to the individually selected bridesmaid dresses. 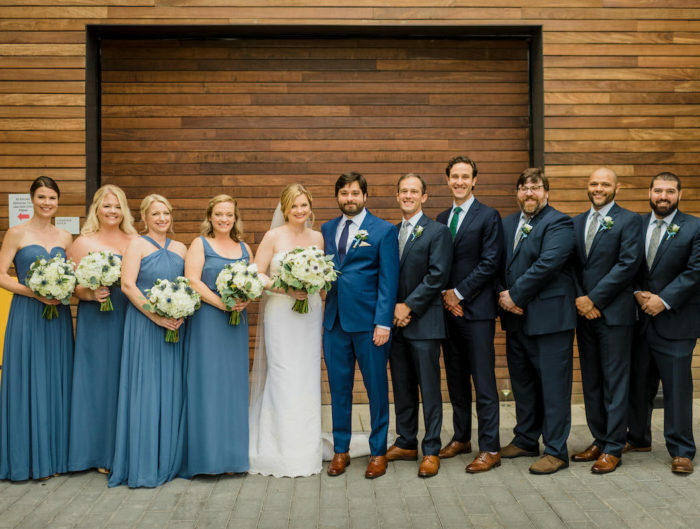 And, we love that the groom wore a completely different color than his groomsmen! We can’t get enough of their wedding-day style! Thanks to Aly and Matt’s wedding photographer, DuHon Photography, and their wedding planner, A. Dominick Events for sharing this sweet, urban wedding ceremony with us! From Aly: I had all the bridesmaids just pick their own coral dress. Rather than pay $300 for a dress that would never come out of their closet again, I thought they could spend $50 or $500 if they wanted. I was so nervous that it was going to look bad because coral is a tricky color, but my girls pulled it off! They looked beautiful. My favorite memory is right when I started to walk down the aisle. I thought I was going to be hysterically crying…I can be a tad emotional…but I couldn’t stop smiling. I saw Matt standing there and just felt so happy…so safe. I got the butterflies all over again. Something really important to us was that we wanted the person reading our vows to be someone who has known us during our entire relationship. That ended up being Matt’s best man, Chris. Looking out and seeing everyone I love…then looking next to me and seeing Chris there…then looking across from me and seeing my husband to be…we were surrounded by love on our wedding day! Congratulations to Aly and Matt! 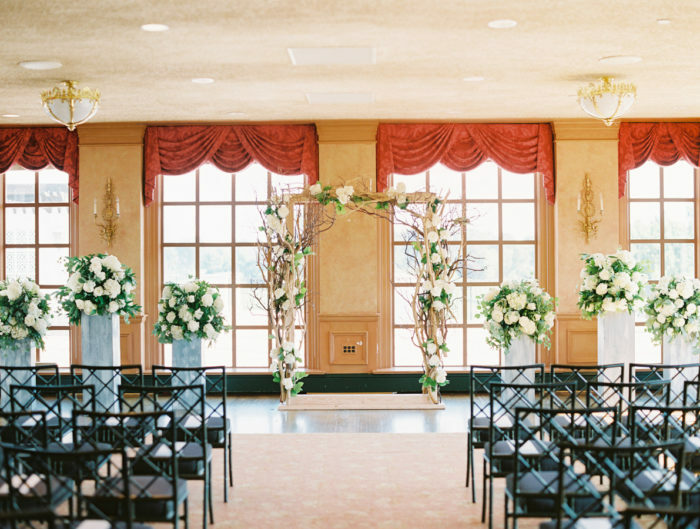 Thank you for sharing your beautifully bright and cheery Washington DC wedding ceremony with us. Stay tuned for their art gallery wedding reception up next!